Are you tired of dealing with snaps? 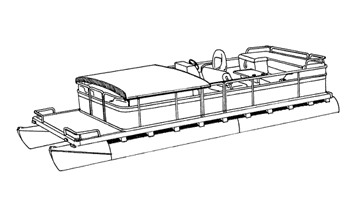 Covering your pontoon boat does not have to be a pain! Our cover utilizes a shock cord which is tight like a bungee throughout its entire hem, so you can install and remove it with ease. Also featured throughout the hem are tie down loops, which are sewn in every 2-3 feet. Our cover comes with a free set of 12 tie downs for the purpose of tying it down to the trailer, but you also have the option of using mooring bags or suction cups for storage on the water. Our covers can be used for mooring, storage, and trailering. 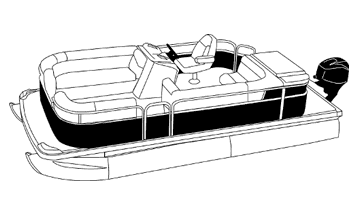 A motor cover is included with each pontoon boat cover. Snap patches are sewn into the inside of these boat covers, for use with our boat cover support poles. These poles are made to snap right into the patches sewn inside the cover, creating a tent like effect which will aid in water runoff. A storage bag is also included with each cover. 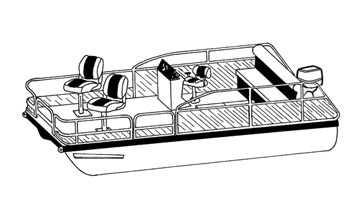 If you have a Bimini top on your pontoon, just release your rear brace to allow the top to lay down to the boat. The cover will go over it with no problem. Our covers are made to cover the entire boat including both the playpen and open deck area. It will come down and snug right below your decks. 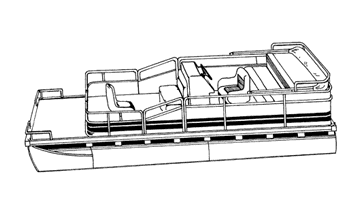 Our pontoon covers are available in a few different material options: Cotton Duck, Poly-Cotton, Poly-Guard, and Sun-DURA. Either the Cotton or Poly-Cotton options are great materials for indoor or light outdoor storage, and they are excellent for breathability. Poly-Guard and Sun-DURA materials are both constructed from a loom woven marine grade polyester. Sun-DURA comes in more color options, and is going to be a bit more water repellent and fade resistant. Either of these materials would be a wonderful choice for outdoor storage. Warranties on these materials will range from 1-7 years. 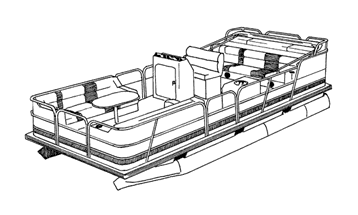 Made in the USA by Carver Industries, our pontoon covers are some of the best ones available on the market! Carver has been in business for many years, and like CoversDirect®, they pride themselves on excellent customer service. Choose a Carver pontoon boat cover from CoversDirect® and we guarantee you will not be disappointed! Looking for a Bimini Top? We have those as well!